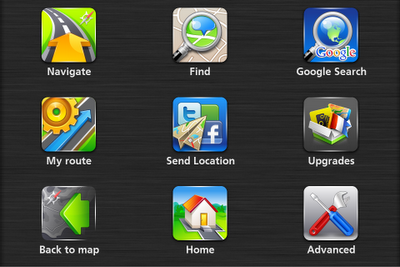 Here comes another GPS app that is AppRadio compatible. Well, almost. Although not compatible yet, a recent video post on YouTube from Pioneer suggests the little-known navigation app, Navfree GPS Live USA could be on the verge of AppRadio compatibility. The app is free in the App Store. I've downloaded the app but haven't used it yet. Just searching for it in the App Store revealed over 30 results. 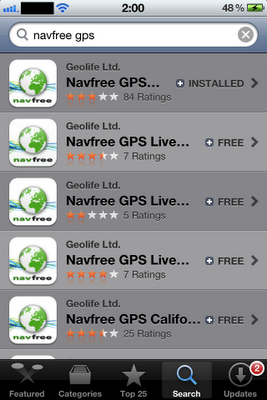 The Navfree GPS apps are available in many versions based on the region. There are separate apps for almost every U.S. State along with apps for the U.K., Australia, Brazil, India, Germany, France etc. But the one that's shown in the YouTube video inside the AppRadio folder on the iPhone is the Navfree GPS Live USA app. The app looks good on the iPhone with clear maps and a well organized menu. But it isn't ad free which is annoying (strike one!). Also, there are no voice commands available (strike two!). And, you need to download the maps for each state before you can use the app and these downloads are quite big (strike three!). The maps are available for free as in-app downloads. For example, I downloaded the California maps and it took almost 20 minutes to download and install on my 18 mbps internet connection. The actual size of the downloads aren't mentioned. For now, though, the app isn't AppRadio compatible so you needn't download it. If and when the app does become AppRadio compatible, I'll have a more in-depth review ready. 1. Voice commands are available and included. Additional voices can be purchased as an in-app purchase. 2. 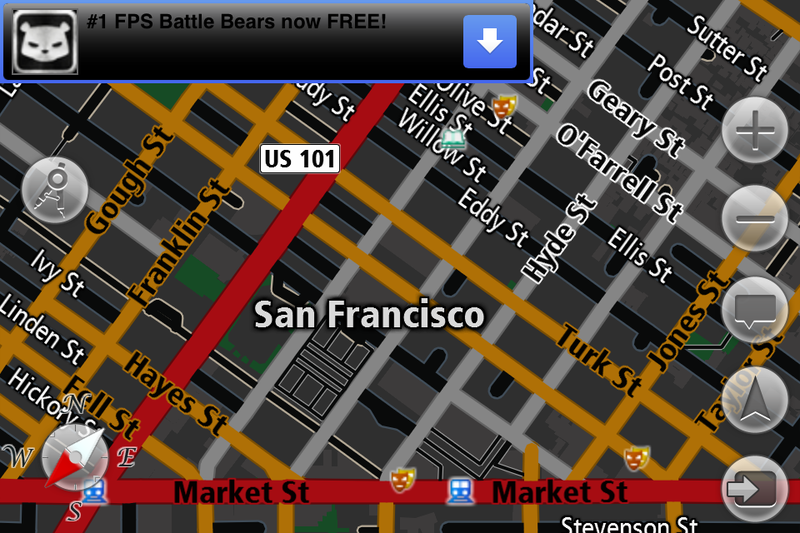 Ad-free version is available for $1.99 extra, also an in-app purchase. 3. Not all functions/features are accessible from the AppRadio's screen. A message pops up that says "This functionality is not supported on TV Out". The interface is pretty snappy. It looks good on the AppRadio too. It isn't stretched out, fills the screen nicely and has a much better on-screen keyboard for text entry (compared to the stock AppRadio on-screen keyboard). Also, there is button which gives access to the songs in your iPod library. So you can listen to that music while the app navigates you. I will post screen shots soon. Check back later. Here's what the AppRadio-connected page on the iPhone looks like when running Navfree (Yes, it is a low resolution non-retina display image). The app isn't officially AppRadio compatible yet. So hopefully an update is coming. Extra Mile is still a better option for navigation in my opinion. the app is official in itunes France...and the problem of fit to screen is that sometimes it's "stretched" normal, and sometimes it's smaller than the appradio screen...really "crazy"
Thanks for extra mile, but not sure that was updated for europe... ? 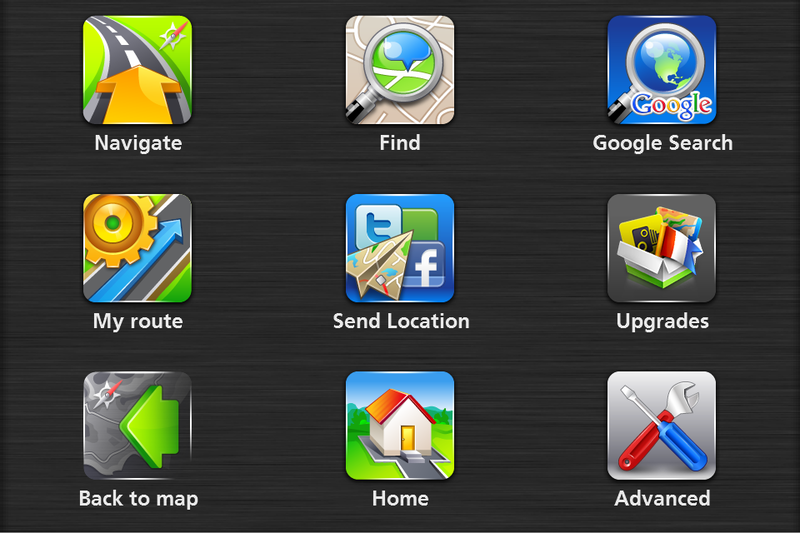 The best app would be waze gps, that works with appradio 2nd generation and android ????? Hi. Just downloaded this app for android. Only problem is it doesnt seem to use th appradio2 gps antenna. My galaxy s3 lives in the glovebox and all i get is poor gps. Dont get any problems with waze. Any ideas?? Thanks.